Flower girls. So precious. Like little miniature-sized brides they add so much charm to your wedding day. Their innocence is so refreshing and most are so very enthusiastic about the role they are playing on your special day. It warms my heart every time I see a little flower girl having her hair done with all the bridesmaids. Perhaps she’ll even be allowed to sport a dab of makeup. They are so serious as they walk down the aisle before the bride, casting rose petals along the path that the bride and her father are walking to where the groom will see his bride in her wedding dress for the first time. 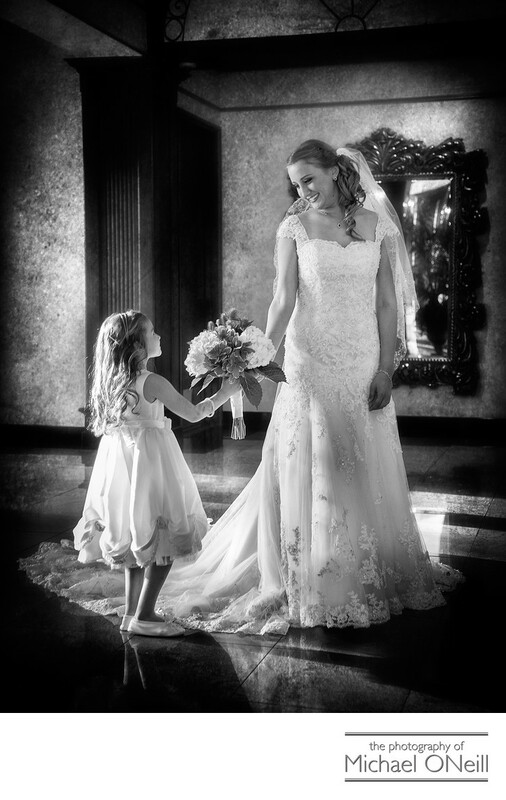 This wedding photograph was taken in the elegant main lobby of Villa Lombardi’s in Holbrook, New York. The natural light that flows into this fantastic area from the floor to ceiling windows has such a beautiful quality to it. I have been associated with the Lombardi family for almost two decades now and have photographed more wedding celebrations at Villa Lombardi’s than I could possibly remember. Not only do I have a lot of experience working here but I also have photographed countless weddings at their other venues: Lombardi’s on the Sound in Port Jefferson, NY and Lombardi’s on the Bay in Patchogue, NY. If you are planning a wedding at any of the Lombardi’s venues I urge you to contact me at your earliest convenience at my East Northport, NY gallery and studio (Convenient to all of the Lombardi locations).